[CONT](VC):During your turn, this unit gets [Power]+1000 for each unit named "Snogal" or "Brugal" on your (RC). [AUTO]:[Choose a «Royal Paladin» from your hand, and discard it] When this unit is placed on (VC) or (RC), if you have a «Royal Paladin» vanguard, you may pay the cost. If you do, search your deck for up to one card named "Snogal" or "Brugal", call it to (RC), and shuffle your deck. ...so essentially, this is a poor man's King of Knight, Alfred as it gains a nice point boost but only if you have Brugals or Snowgals on your field. Snowgals are passable as they themselves become stronger for every one that's on your field, but Brugal is just horrible as it's a starting Vanguard, and there's no easy way to really abuse it as Snowgal does it's job but better. With that said, Garmore can be at 14,000 by itself and 23,000 with the 4 Snowgals. It's a nice number, but the problem is that your devoting your field to something so fragile that a Kagero or Narukami deck can easily pick apart. Also, Garmore is only 10,000, and anyone that reads my reviews knows that I really don't like 10,000 Vanguards unless they have a good effect, but this one leaves more to desire. Overall, run this is you are running Snowgals and can't afford Alfred for some insane reason. 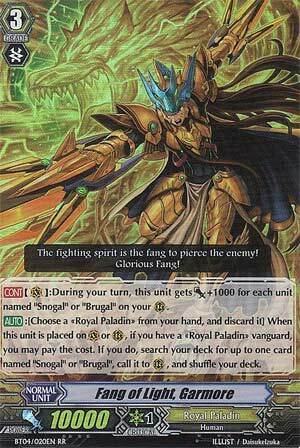 Fang of Light Garmore is a very specific grade 3, that belongs in a deck that is not widely used at all. Most people have come to know this deck as the Royal Paladin Blizzard Formation. He superior calls the help from your deck. he gains power for every snogal and brugal in play during your turn (making a strong center line attack). Basically Fang of Light, Garmore belongs in his deck and play only when you feel the need to emulate the anime. Art: 4/5 He slashes his way with the spirit of the wolf.